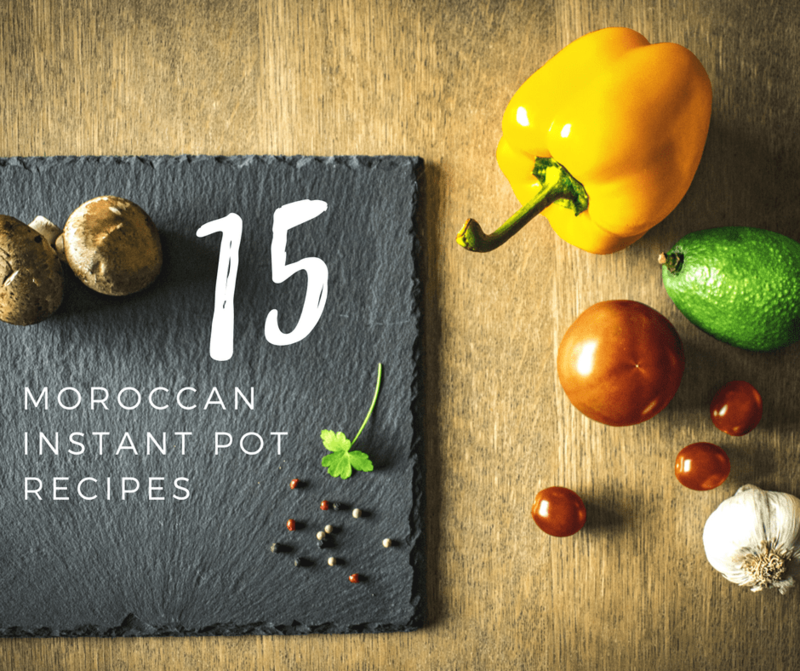 15 Moroccan Dishes for Your Instant Pot! Have you tried the Instant Pot yet? This handy appliance has become all the rage recently. If you read cooking blogs, you have undoubtedly stumbled upon people talking about the Instant Pot by now. It has become incredibly popular of late, and with good reason! What is it? The instant pot basically does the job of seven different appliances. With the push of a button, your Instant Pot becomes a yogurt-maker, a steamer, a slow cooker, a rice cooker, a warming pot, a saute pan, or a pressure cooker. Comparably priced with appliances that do half as much, the Instant Pot seems to gain a bigger fan base every day. I have long loved slow cookers (even though MarocBaba doesn’t share my fondness), and my trusty pressure cooker gets a regular workout, too. Before we moved to Morocco my dad gave me an earlier version of today’s Instant Pot and I swore by it. Do you have an Instant Pot? I’d love to hear what you think about it! And whether you have an Instant Pot or a regular pressure cooker, I offer you the following recipes for some delicious taste adventures you can take without leaving home! NOTE: For recipes that are using a pressure cooker the standard conversion is if the meat dish cooks in eight hours on low or four hours on high in the slow cooker, it will cook in 25-30 minutes in the Instant Pot. 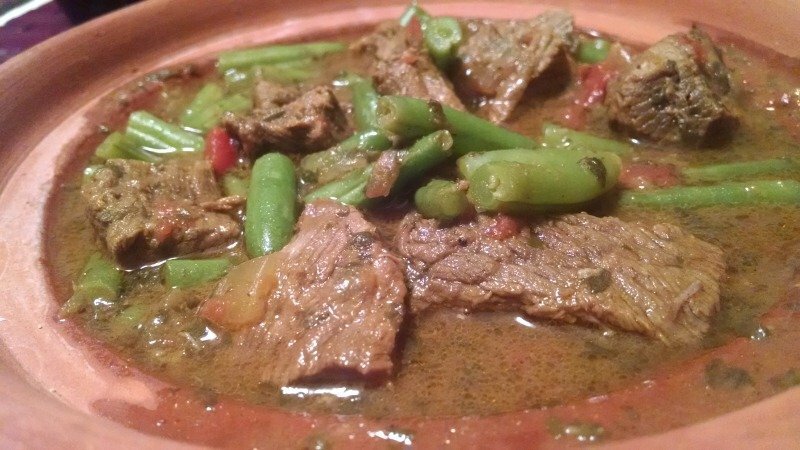 Tangia is a traditional Marrakech meat dish that is unbelievably delicious. Seasoned meat is cooked until it is falling off the bone and eaten with bread. Traditionally, this dish was cooked up by men on Friday (the Muslim holy day). Check out my post about Making Marrakechi Tangia at Home to learn how you can make it yourself! After enjoying this delicious dish in a local restaurant here in Marrakech, I simply had to try this at home. The trickiest part was obtaining Turkish figs , a personal preference of mine. Depending on your location, it might not be easy to find lamb at certain times of year. 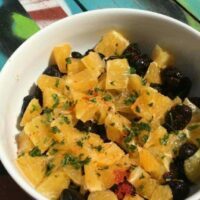 But when you find it available, I highly recommend that you give this tajine recipe a try! 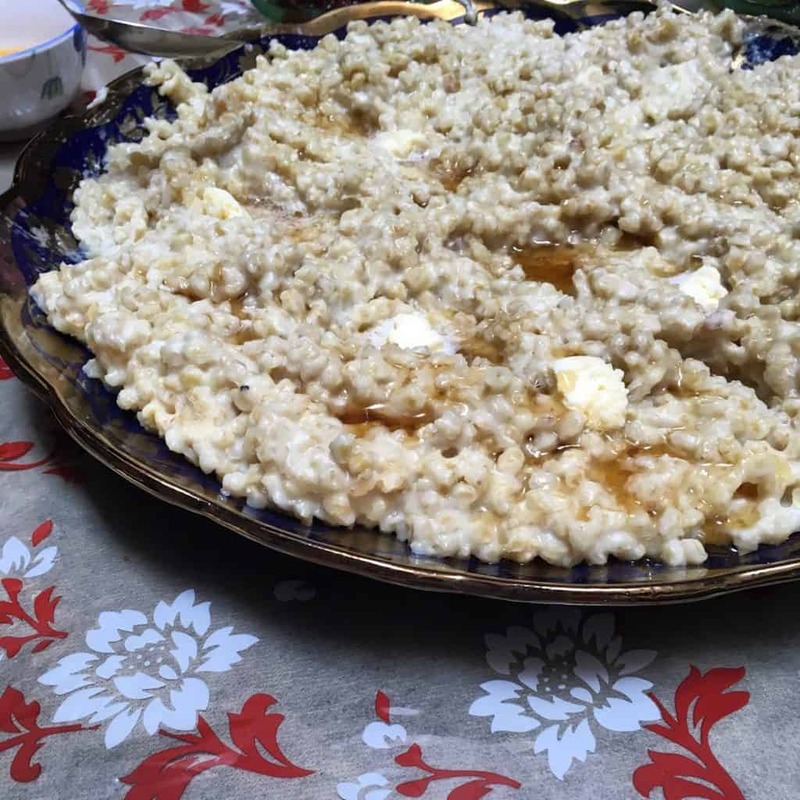 This simple and delicious recipe for our favorite winter staple – b’ssara – is made even easier in the instant pot. This dish is vegan, vegetarian, gluten-free, and incredibly healthy. Typically eaten as a snack or breakfast in Morocco, drizzle with good olive oil, sprinkle with cumin and combine it with some nice bread so you can scoop up every last drop! Beef tajine with prunes is one of my favorite dishes. Traditionally served at special occasions like weddings, including my own, this meal is unbelievably delicious. Normally made with lamb, it is also amazing with beef. It’s always served with bread so that you can scoop up all the delicious bits! 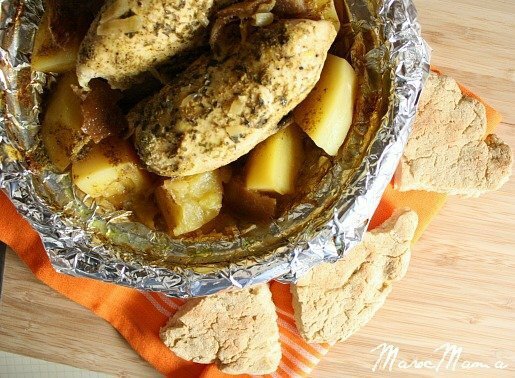 With preserved lemons, tart olives and creamy potatoes, this chicken tajine is delicious, comforting, and tantalizes you with amazing flavors. If you’ve been to Morocco you’ll instantly recognize this tajine served in nearly every restaurant you would have visited. I understand that my recipe for Beef Tajine with Apricots might sound a little odd if you aren’t accustomed to Moroccan cuisine. But combining both fruits and vegetables with meat is actually quite common. And once you taste how good it is, you’ll be a believer, too! When making this Pan Fried Chicken Breasts with Zucchini Coins, the pressure cooker is completely optional. While it does shorten the cook time a bit, the main flavor comes from pan frying the chicken until it is nicely browned and completely delicious. 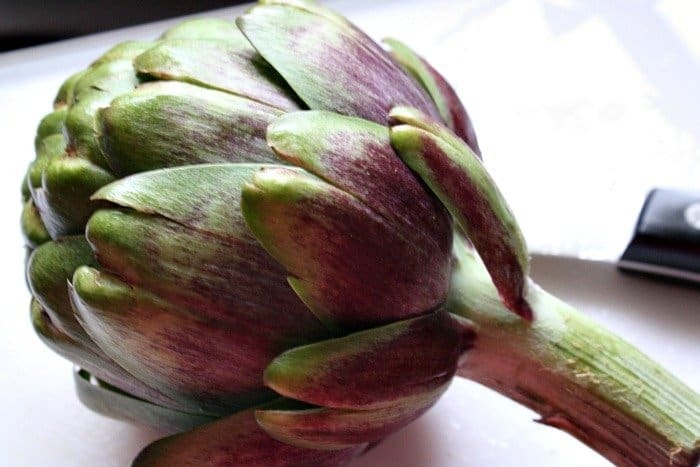 The first time I made this, I wasn’t sure if I actually liked artichokes or not. Turns out, I love them. 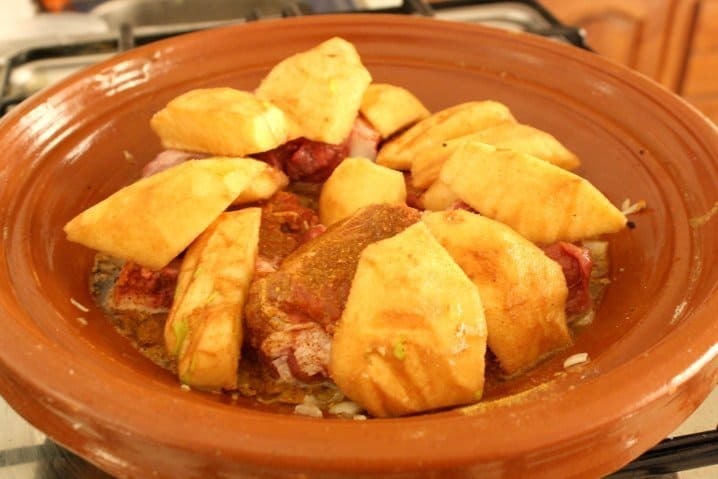 Try this delicious Beef and Artichoke Tajine and find out how much you love them, too! I love to make a good Tajine. There are so many amazing flavor combinations you can put together. This delicious Beef Tajine with Cauliflower is the perfect example. Cook it up in your pressure cooker so the meat is falling apart tender and add vegetables and spices for a healthy, comforting meal. Looking for something a bit different? 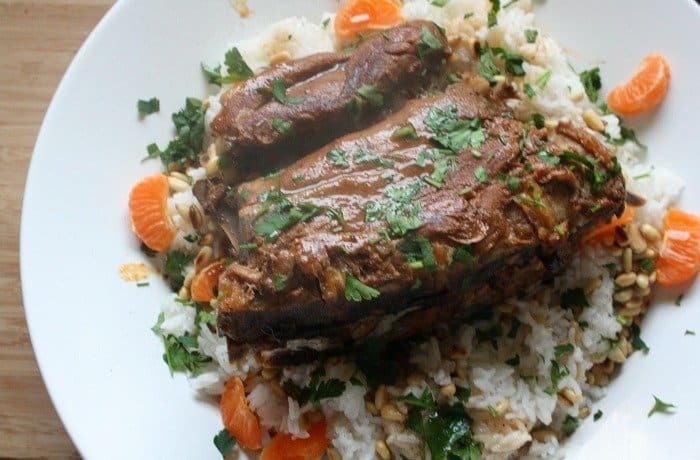 Try this Moroccan Tagine Lamb Roast with Mandarin and Pine Nut Rice. You can use your instant pot for the tajine and for the rice! I think you’ll really like the flavors here and it’s something really different. Another great recipe to make with leftover lamb, is lamb kebabs, in a sauce rich with lentils and tomato goodness. Cook those lentils nice and soft, the way they eat them in Morocco. Rich in flavor, this is the ultimate comfort food! Many people know argan oil as a beauty treatment. But it is also quite delicious, nutritious, and adds a distinctive nutty flavor to food. I decided to try some with beef in this Beef Tajine with Argan and I was quite pleased with the results. If you enjoy lentils, you owe it to yourself to give this recipe for Lentils with Caramelized Onion a try. Lentils are cooked until very soft in Morocco, and the tomatoes, garlic, onion and seasonings adds a taste delight you just have to try for yourself. It’s also a perfect recipe for vegans and vegetarians! If you’ve never had a Quince, I hope you get the chance to try one. When cooked, this fruit tastes a bit like a happy marriage between a sweet potato and an apple. It can be tough to find, especially in the Midwestern United States. But when you do, you’ll want to be sure to give this One Pot Beef and Quince Tagine a try! Rich and delicious, Beef and Chickpea Tajine is easy to make in a pressure cooker. The heartiness of the chickpeas combined with meat that is falling apart tender makes my mouth water every time. Serve with a crusty loaf of bread for an amazing meal! If you try any of my recipes, I would love to hear what you think. I hope you have the chance to take your own taste adventure as soon as possible! Need an Insta Pot? Check out some of these! We are spoiled rotten in Morocco with oranges all year round. But, if you ask my opinion, I think the best oranges appear in winter. What are these delicious little bites of sun-soaked goodness? Mandarins. Some smart marketers in the US started calling them cuties a few years ago and now whenever I see them I want to just give them a little squeeze. 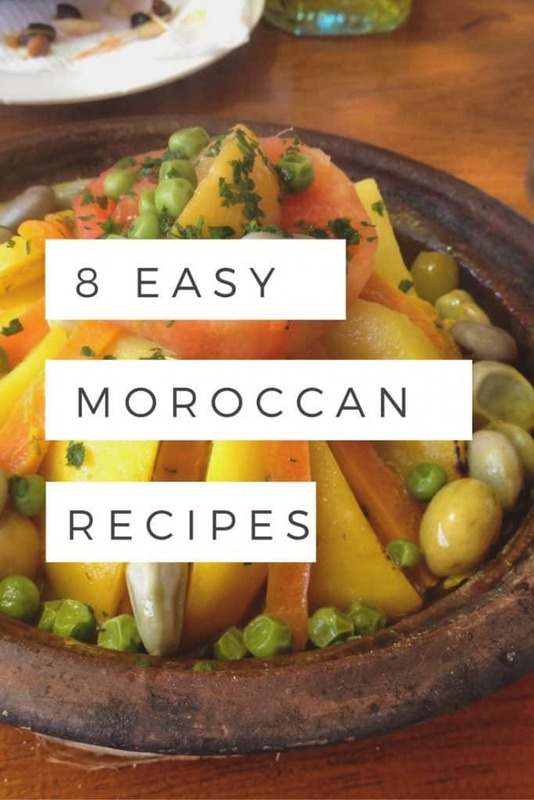 In this super easy Moroccan recipe you can do just that! 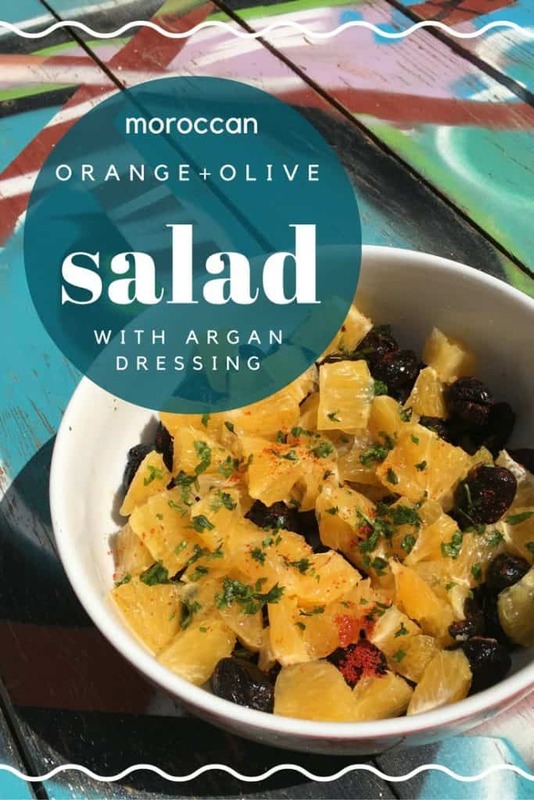 I remember seeing a recipe similar to this many years ago and when I said something to MarocBaba about an orange salad that had olives in it he said I had lost my mind. There was no such thing. But, in September of last year I was at Val d’Argan, a lovely winery with fantastic food outside of Essaouira and this was the first course. Friends, this is a party in your mouth. It is light and lovely. A perfect pick me up from the doldrums of winter. I dare you to hate it. 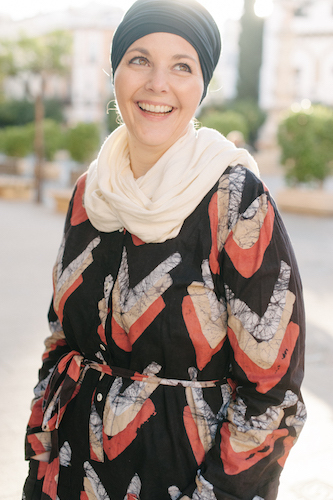 Wondering how to use some of that delicious culinary argan oil you've got? This salad is ideal! Remove the peel from around the orange. Pull apart the segments, remove the inner skin, and cut into bite size pieces. In a bowl whisk together paprika, cumin, garlic and orange juice. 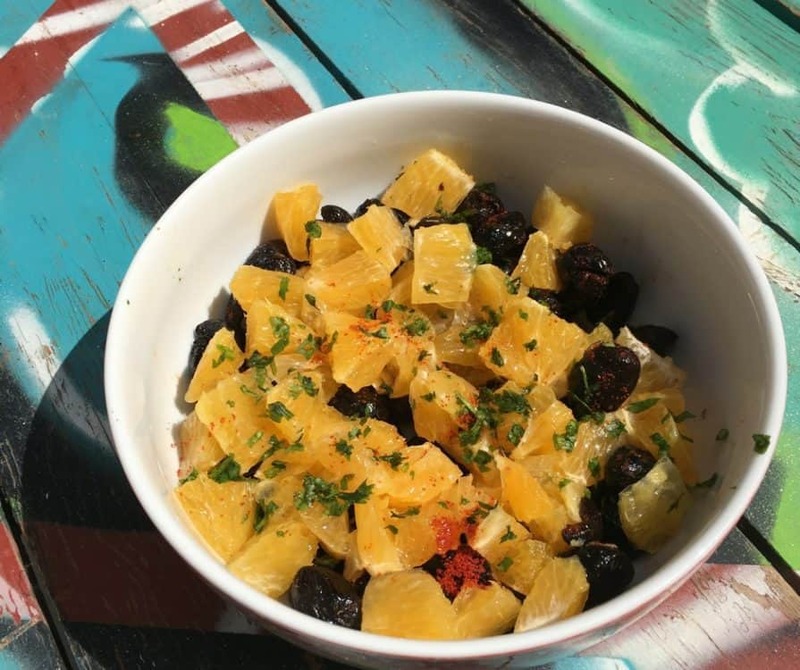 Place olives and oranges in a bowl and drizzle spice/orange juice mixture over the top. Gently mix to combine. Drizzle argan oil on top of the salad and add fresh chopped cilantro. The key ingredient in this dish is culinary grade argan. You NEED to have the culinary variety because it will have the right taste. Cosmetic argan isn't to eat. A lot of people are afraid to start cooking Moroccan food. They want an easy Moroccan recipe. One that’s fool proof and doesn’t have 27 spices to add. Been there, done that! When MarocBaba and I were first married I could barely cook an egg. Our diet consisted of; eggs (remember I said barely! ), hot dogs, and Kraft mac and cheese. Let’s just say coming from home where his mom and/or six sisters would always have a homemade meal three times a day it was quite a rude awakening. “What do you mean you don’t like freezer meals,” I asked. “They’re homemade, I made them in our home!” Not what he was after. 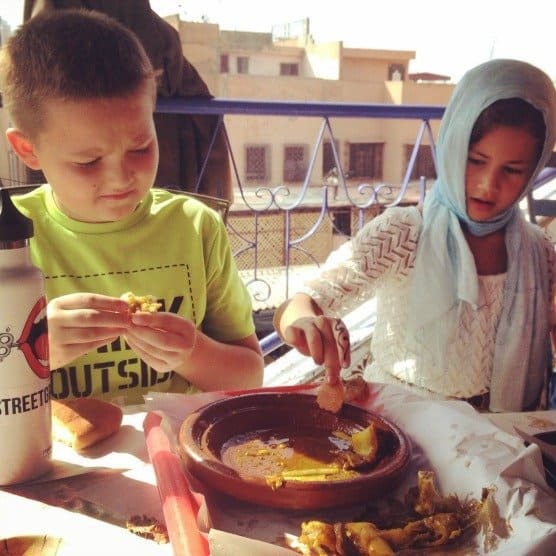 Our Moroccan food adventures were trial and error, emphasis on the error. We’d call and have someone walk us through simple recipes. I’d fiddle with cookbooks and try recipe after recipe. Many were miserable fails, but eventually I got the hang of it. 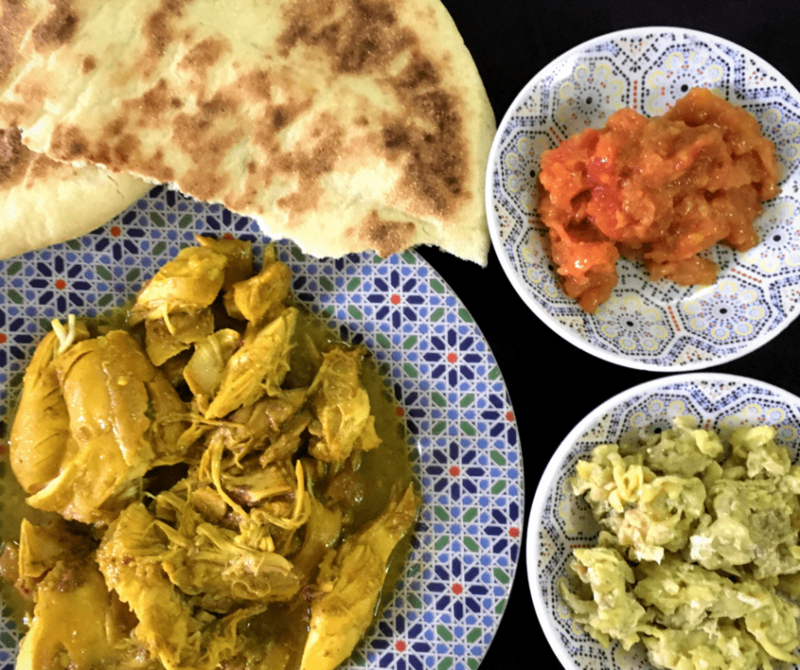 So many people in Morocco are surprised when they ask if I can make a Moroccan dish or two and I tell them, I can in fact make most all Moroccan dishes. MashAllah they tell me. It’s not magic my friends, I just had years or practice and a very patient husband. But, not everyone has the time, energy, or desire to learn all the dishes. For you, I put together these eight dishes that really are very simple to make. They don’t have a lot of ingredients but do read through each before you start so that you have an idea of the process. Then let me know which you tried! This is possibly the easiest Moroccan recipe you can make because it requires no cooking at all. In winter oranges are everywhere in Morocco. There’s a guy outside my door who sells kilos of them all winter long. So it makes sense that we eat a lot and they’re the defacto winter dessert on restaurant menus. Super simple. 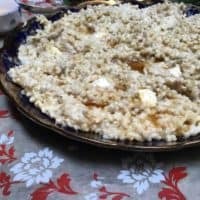 I love winter in Morocco for this soup alone. It’s our go to meal for breakfast or lunch during cold months. It’s also easy to make in a pressure cooker or slow cooker (just get this instant pot and you’ll be set). 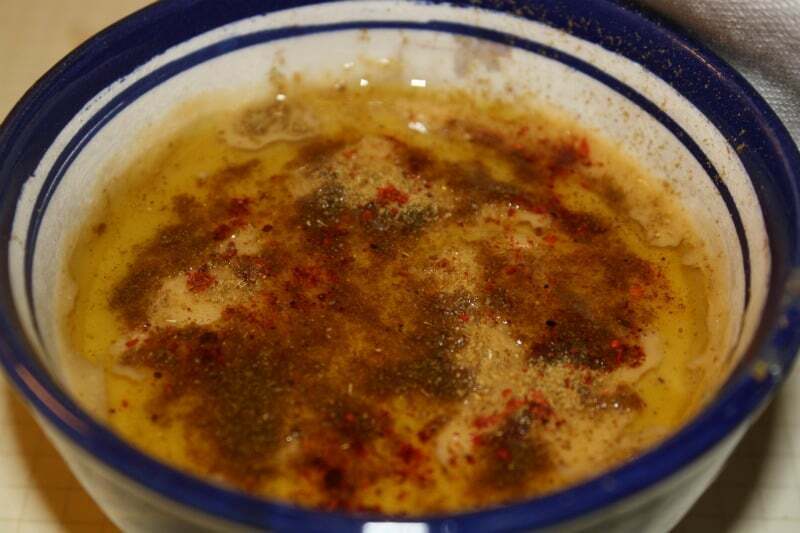 Really good olive oil to drizzle on top as well as cumin and paprika if you desire. So good. So so good. There are countless Moroccan salads, but this is one of the easiest. You can swap out the carrots for any cooked, seasonal vegetable and use the same dressing. So hear me out on this one. If you really dislike fish, you won’t like this. But if you do like it then give it a try – really. Fresh sardines are used to make the little fish meatballs and the condiments take it up a notch. You could use any fish really; from salmon to trout or whitefish. Trust me, this is a good one. One thing I wish I had in Morocco is a good slow cooker but the pressure cooker is the preferred electric tool. 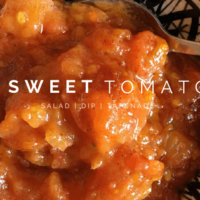 This recipe is really quick to put together and everyone will enjoy it. It’s also very economical as you can opt for a cheaper cut of meat due to the long cooking time that will make it nice and tender. Tangia is the official dish of Marrakech. So many Moroccans ask me if I know how to make tangia when they find out I live in Marrakech. Of course I know how to make it and you can too. A handful of ingredients and a pressure cooker will have you on your way. Of course you can always opt for the clay tangia if you have one laying around! 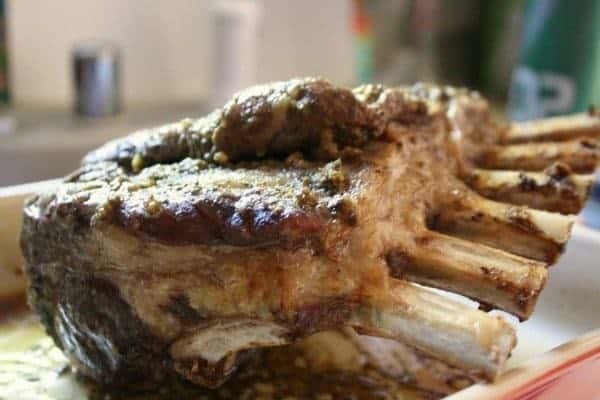 Does the thought of cooking a rack of lamb make you tremble? Don’t let it! 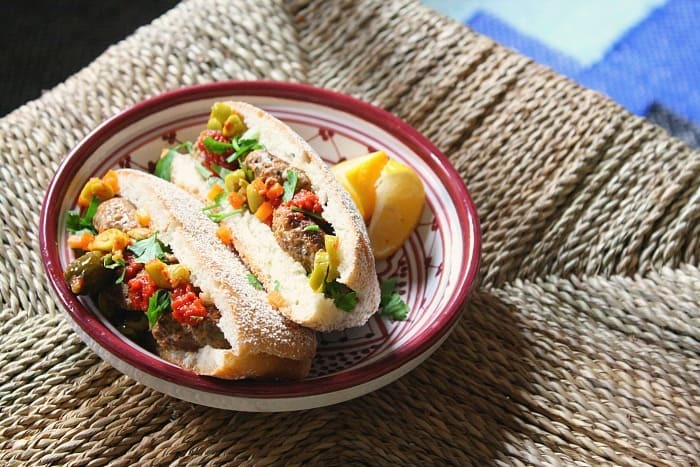 This super simple Moroccan recipe will make everyone think you’re a top chef! The ingredients are minimal and the flavor is to die for. I wish I had some of this right now. 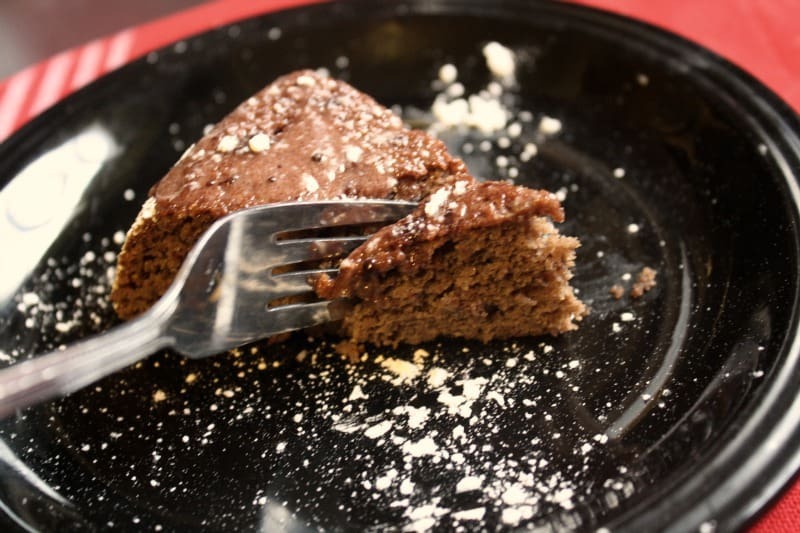 Everyone needs some dessert and this cake is really easy to make. Just a few ingredients and pop it in your oven. Honestly, I don’t bake and this is an easy, go-to recipe! Go out and create – then let me know what you made! 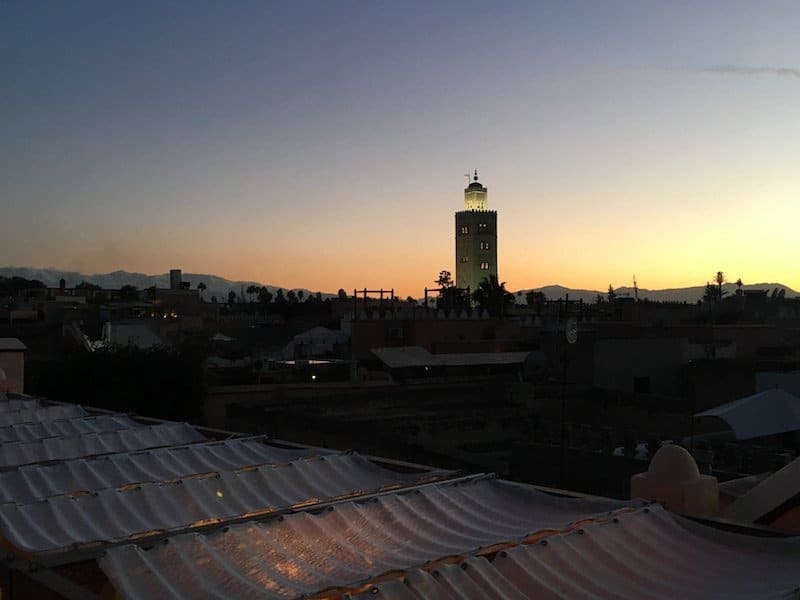 Winter comes slow and late to Marrakech. One day we’re sweating, wondering when the heat will finally break and then suddenly there’s a rain storm one day that snaps the weather awake to realize it’s time to change seasons. Reluctantly the weather wavers for a few weeks. Alternating between those scorching hot days and dreary, rainy ones. A sandstorm might blow through and then we’re lurched into winter. But this too is beautiful. The haze in front of the High Atlas lifts, giving way to the beautiful mountain backdrop that makes my heart sing. It’s a sight I wait for all year. Rarely do the mountains appear until they’re capped with snow, leaving many people to believe they have snow all the time (they don’t). The clear, sunny winter days are what I love waking up to. I just really hate leaving my bed! Few people, including us, have indoor heating. We really don’t need it. Winter will only last two or maybe three months and it will never get to freezing – even though some days feel like it. An extra blanket on the bed, a space heater tucked under the desk, and taking advantage of every chance to warm up the house when the sun shines make it possible. 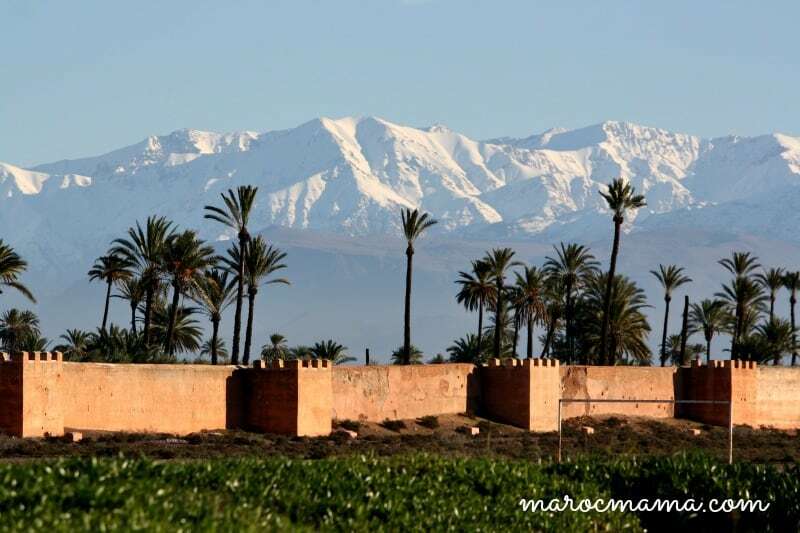 You see Morocco is a cold country with a warm sun. The sun changes everything and even in the middle of winter is warm. Our morning start a little later now but it’s still just barely light when the kids get up for school. I love a warm bowl of oatmeal in the morning with nuts and brown sugar. 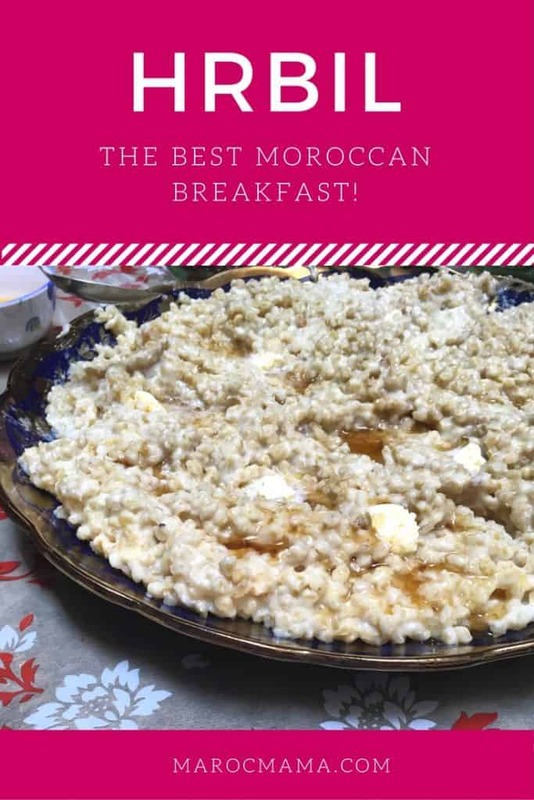 But, I also love the Moroccan version of oatmeal – that’s not made with oats at all – called hrbil. Normally it’s only made for special occasions. It’s always on the table the morning of Eid al Adha and Eid al Fitr. But, I’ve also made it and saved it in the refrigerator to heat up the next day. It’s always better right after it’s made. A delicious breakfast dish served during Eid and other special occasions in Morocco. Soak the wheat in water overnight. The longer you soak this the faster it will cook. When you're ready to cook, add the olive oil to a pressure cooker and drain the water from the wheat. Add the wheat to the pressure cooker and stir to coat with olive oil. Add enough water to fill pressure cooker about 1/2 full. Cover and cook on medium temperature for about 45 minutes – 1 hour. You will need to check the water level of this often. The goal is to cook out all the water so that the wheat plumps to it’s maximum. You can test the water level by holding the pressure cooker off the heat and swirling around. When you feel most the water has been cooked out, release the steam and remove the cover. If there is some water left, continue to cook on low – medium heat until it has been mostly removed. Stir in the milk, until the consistency is a little more liquid than porridge. Fill a bowl or large rimmed plate with the grains. In the middle create a small well and add olive oil, butter, and honey. Christmas is right around the corner! Instead of giving the hottest new items on the shelf this year, why not give a gift that is truly unique. 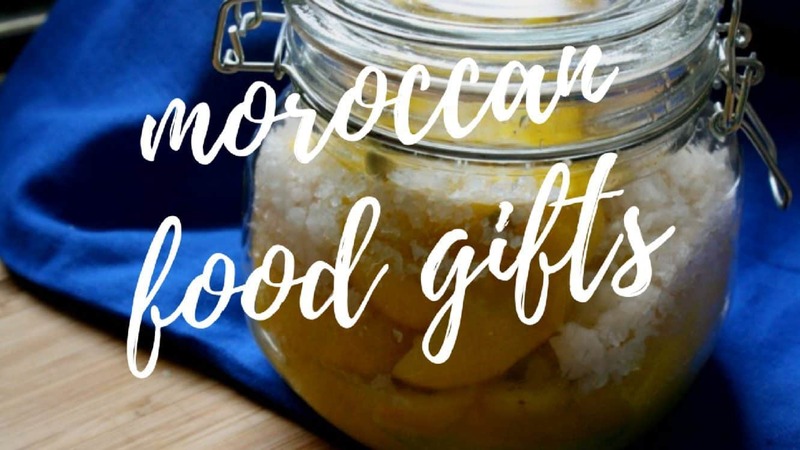 Take your loved ones on a foodie travel adventure from the comfort of home with these homemade Moroccan gift ideas packed full of the flavors of Morocco. You’ll want to get a start early as a few of these gifts, like preserved lemons need a little shelf time to be ready! Ready to get your garlic on? 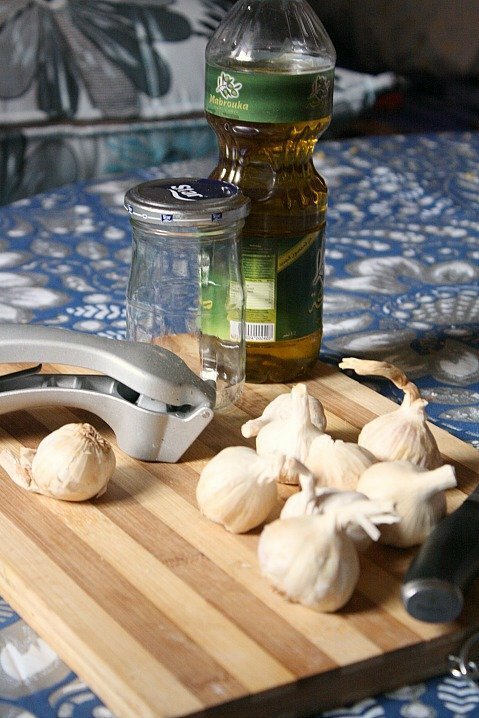 Garlic packed olive oil is a heavenly ingredient that can be found in the souks, but it also is incredibly easy to prepare at home. 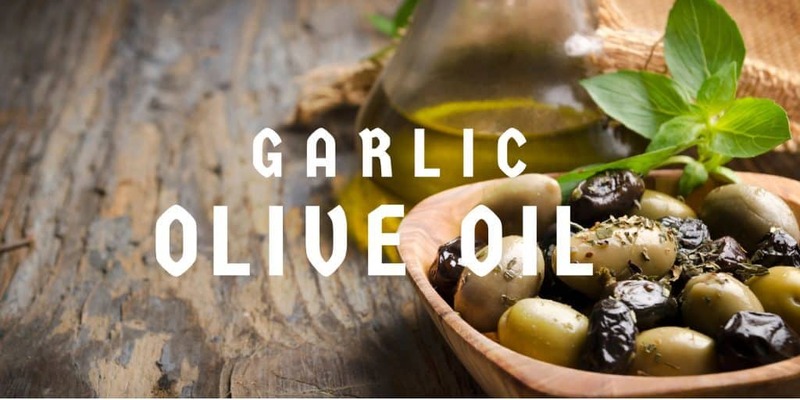 This oil makes a great dipping sauce or a shortcut for recipes that call for cooking minced garlic in oil. Need more convincing? It’s the perfect, budget friendly gift! Do you have a hot sauce enthusiast on your Christmas list? 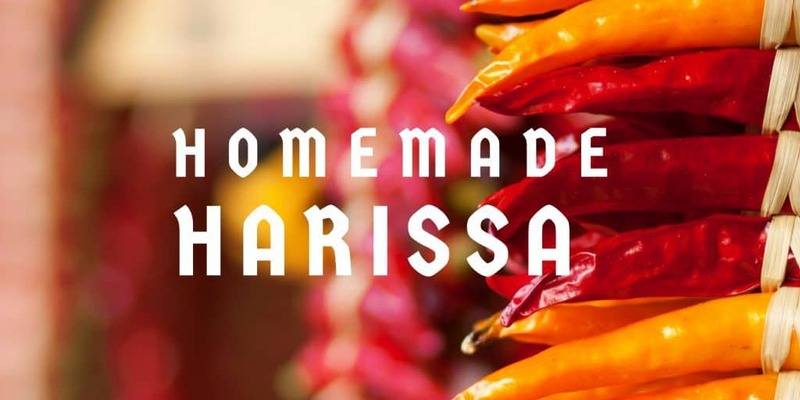 Homemade Harissa is for you (or should we say, them)! 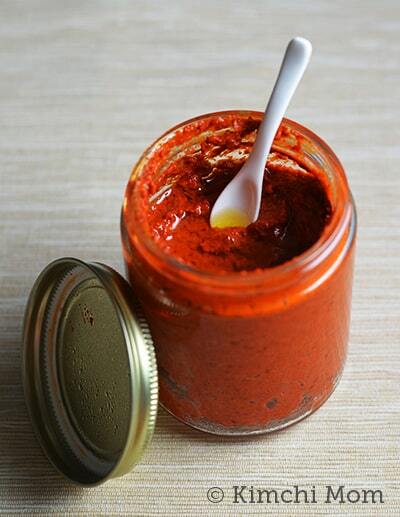 Add this favorite Moroccan condiment to breakfast eggs, noodles, meats – basically anything that needs a little heat! The flavor has a unique, smokey pepper complexity unlike other hot sauces on the market. This recipe is by far one of the favorites on the site. 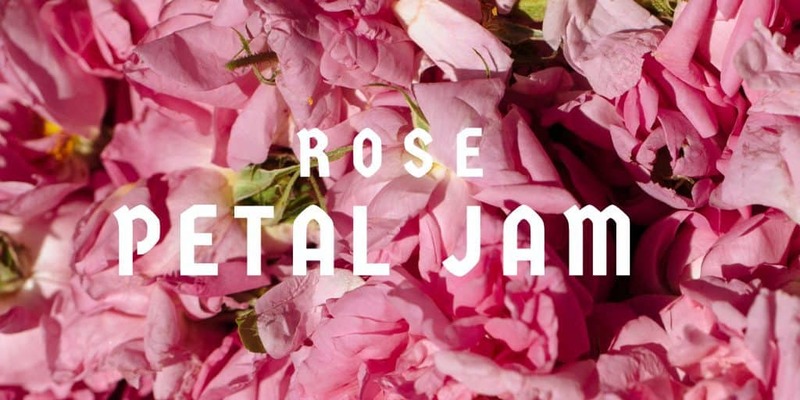 Roses play an important role in Moroccan medicinal remedies and these queens of the flower world are also seen in Moroccan cooking. 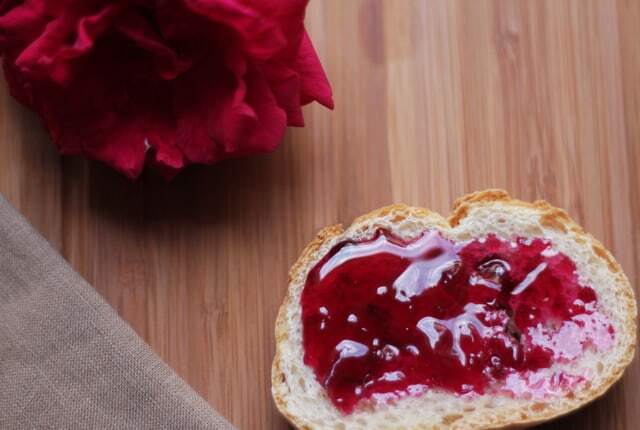 For friends and family who love breakfast treats like biscuits and scones, make their mornings sweeter this holiday season with Rose Petal Jam. 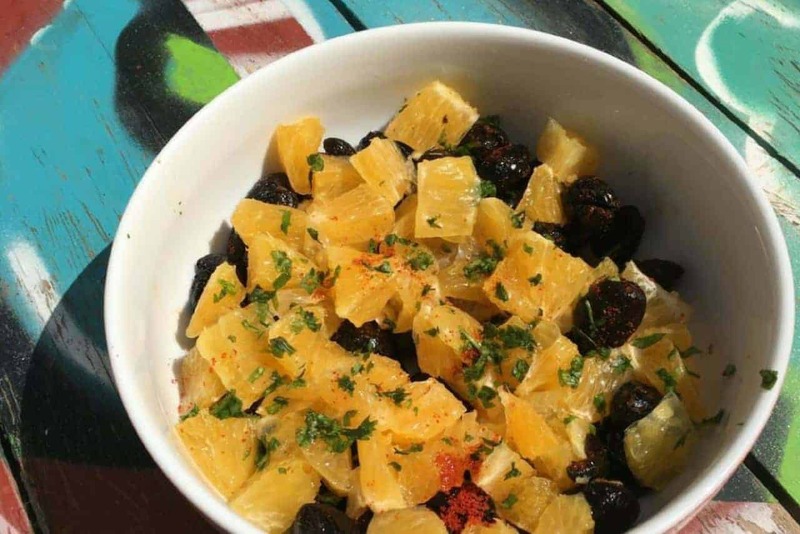 Preserved lemons are THE ingredient that makes Moroccan cuisine what it is. 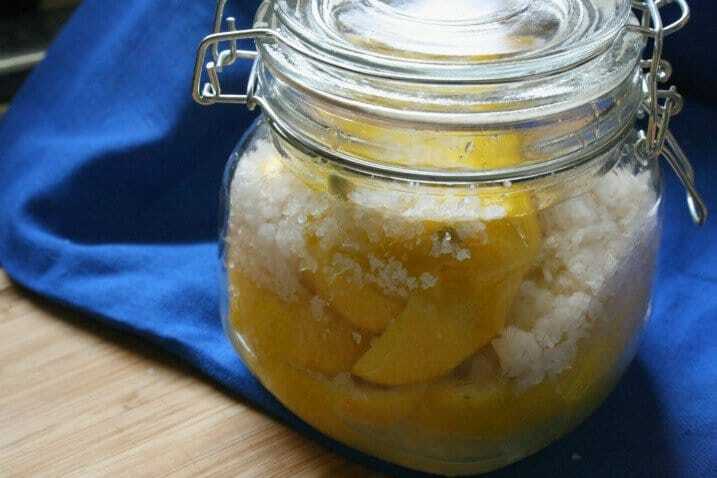 A Moroccan pantry simply cannot exist without a jar of preserved lemons. 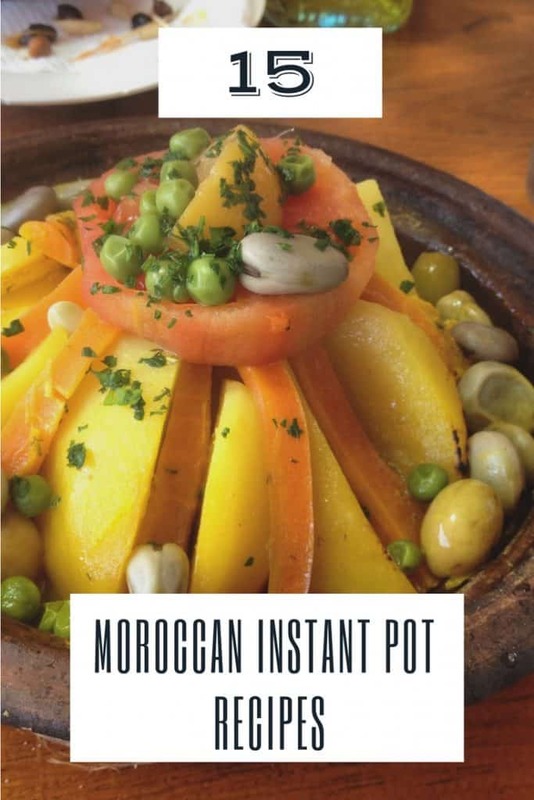 If you know a foodie eager to try their hand at Moroccan tajines, fish dishes or salads, this gift is perfect! 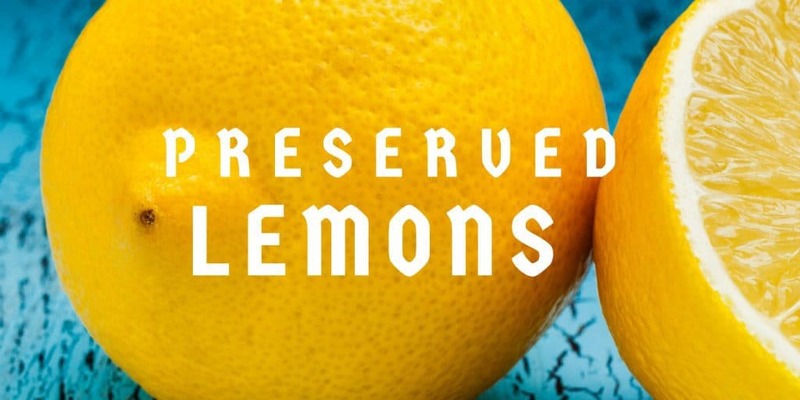 Keep in mind, the lemons take a few weeks before they can be used. You may want to attach a favorite recipe or two OR pair with a great Moroccan cookbook. Gifting dry ingredients to a favorite soup mix is a fun way to share a new recipe. 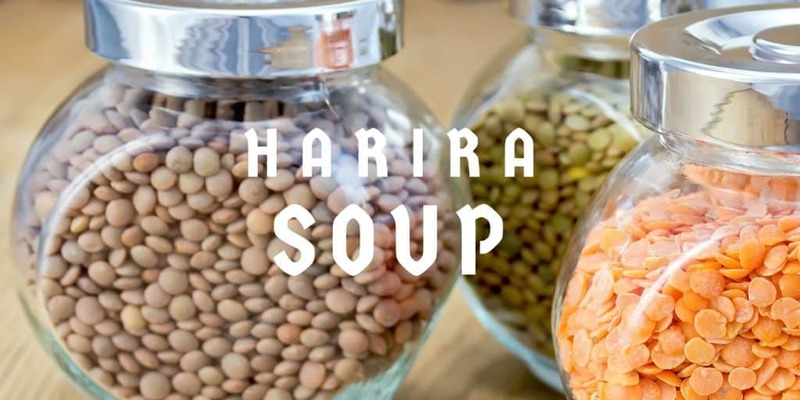 Last year, my step-sister put together gift boxes filled with the pantry ingredients for Vegetarian Harira Soup. 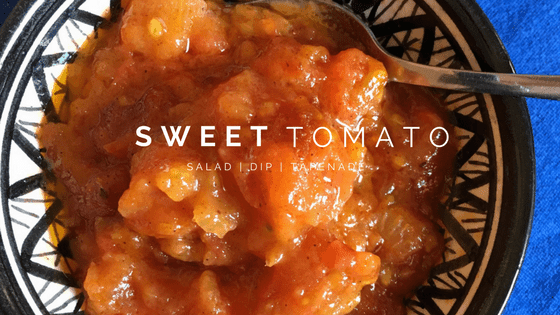 Click over to the recipe and package up all the dry ingredients in a mason jar or another cute container. They were a hit – even with the less adventurous eaters in her family! Be creative with containers and extras. 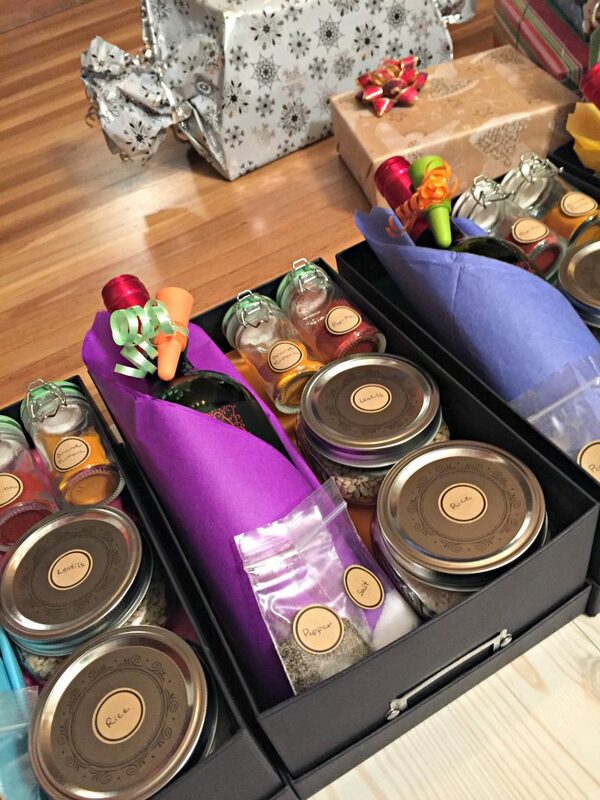 She included a bottle of wine and wine stoppers, but you could easily substitute apple cider or hot cocoa with mugs. Don’t forget to include a copy of the recipe so they know what else to add to finish the soup. 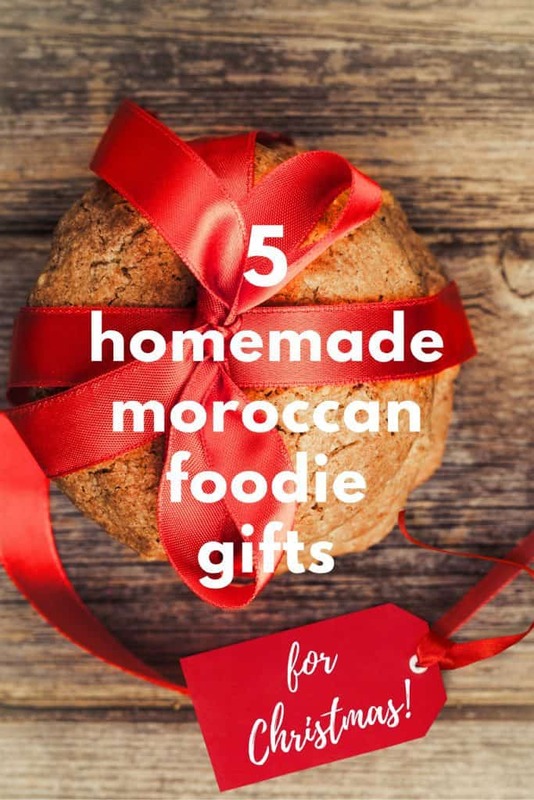 I hope that some of these homemade Moroccan foodie gifts might find their way to someone special in your life this holiday season. There’s nothing better than homemade!